On the A-Cat.org website, we published a report from Mischa on the 8.2 rule discussions going on at some local fleets like the British & Dutch Assocs. In this post you can also find links to Class President explanation on current official submissions and standard procedures of the IACA plus some previous comments he made on this rule. The idea is to have feedback from expert and respected sources, Landy exposed the facts plus some Pros / Cons and now Mischa will add his view. Being current World Champ and also on his Hydros C-Class foiling rides with Bastiaan Tentij he has surely a first hand knowledge too to add to Landy's long experience with the As. There is no official poll / vote currently in place for any change, this is just additional info for sailors to have in mind on the Pros/ Cons on modifiyng this rule , 8.2, that mandates to insert dagger foils from the deck. On the Class health I can announce now that the A Class is being launched in Argentina with an 8-10 boat fleet. And with the history we have here I can assure the As major event will have participation soon of some Argentine fanatic sailors eager to race & learn. This great milestone will create a more global class as it happened with the Formula 18 in past years. 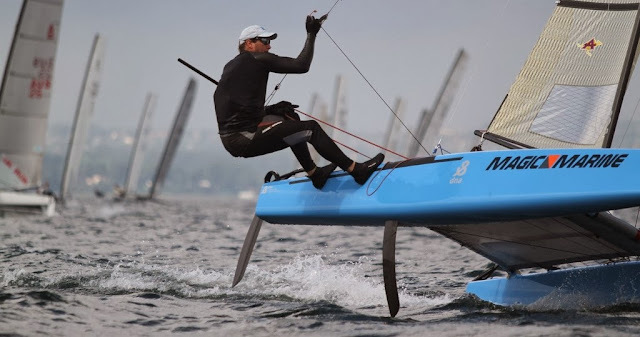 All F18 sailors behind this move, looking for an alternative to ride & race solo on a light carbon rocket. The guys are going for a DNA container and I'm trying to close an Exploder / Saarberg combo.